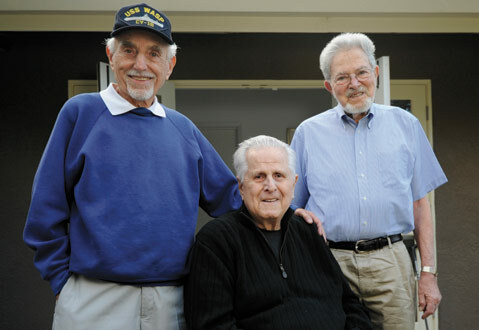 <strong>LEGACY LUNCHEON:</strong> Pictured from left, WWII vets Len Berman, Jack Nadel, and Ralph Baxter will be honored at a luncheon this Sunday. United States Navy veteran Len Berman sailed through a typhoon 70 years ago to return from Japan to the U.S. at the end of WWII. Congregation B’nai B’rith, Santa Barbara’s oldest synagogue, will honor Berman and 17 other area Jewish WWII veterans on November 15 at its inaugural Children of the Covenant Legacy Luncheon. The event fosters respect among the Jewish community for its living and lost Jewish WWII veterans, “who fought for our fate as Americans and Jews,” said B’nai B’rith Executive Director Elizabeth Gaynes. Video interviews with each ninety-something-year-old veteran will be shown at the luncheon, and they will receive 2015 Legacy Awards and copies of their interviews to share with their families. 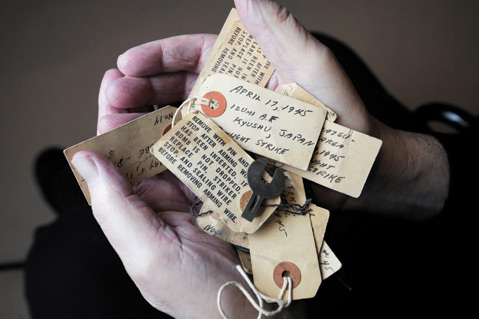 Of the connection between his Jewish faith and his time in the navy, Berman said he attended service on his ship every Friday with the other Jewish boys, who all wore an “H” on their dog tags for Hebrew. The weekly service “gave us a good feeling,” he said. Nadel displays safety pins from his bombing missions. A fellow veteran being recognized for his service, B-29 Bomber Jack Nadel, considers the event “as much of an honor for the people we lost as it is for us.” Nadel, who launched a successful marketing company after the war, collected the bomb safety keys from each of his missions and sent them back home to his Jewish mother in New York City. Also on November 15, documentary filmmaker and philanthropist Nancy Spielberg will speak about her newest film, Above and Beyond, which tells the story of Jewish WWII veterans, their secret missions, and their lives after the war. At a separate screening of the film, Spielberg will answer questions from veterans and congregation members. Courtesy of the Pierre Claeyssens Veterans Foundation, attendees will be able to browse a collection of WWII memorabilia. At $136 per person, tickets to the Legacy Luncheon include lunch, cocktails, and a silent auction, among other entertainment. Tickets will in part benefit the Pierre Claeyssens Veterans Foundation. The Children of the Covenant Legacy Luncheon will take place Sunday, November 15, from 11 a.m.-2 p.m. at Congregation B’nai B’rith (1000 San Antonio Creek Rd.). To purchase tickets, visit cbbsb.org.